The Thousand-Year Door Description A highly nutritious snack. Restores 50 FP. Jammin' Jellies are one of the greatest general FP-healing item in the Paper Mario series (second to Jelly Pop and Jelly Candy). The item can heal fifty FP. This item can be cooked by mixing an Ultra Shroom and a Point Swap. Jammin' Jelly is the FP-restoring counterpart to the Ultra Shroom, and the two put together make the Jelly Ultra, which is able to recover fifty HP and fifty FP. Left by silver Li'l Oinks. Occasionally dropped by an Amazy Dayzee. One can be won at the 64th Trivia Quiz-Off (as Peach between chapter 5 and 6 and sent to Mario via the mysterious chest between chapters 6 and 7). One is found behind the tree near the Mt. Lavalava entrance. One is found in Flower Fields (in the tree behind Lily's pond). One is found in a hidden block (using Watt) in the Crystal Palace (near the Albino Dino statues). One is found on a ledge outside of Bowser's Castle (after the second Guard Door). 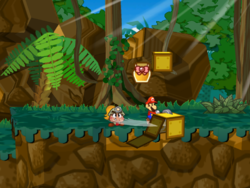 The location of the Jammin' Jelly in the Keelhaul Key jungle. Bought in Rogueport Sewers for 200 Coins. Bought from Charlieton for 120 Coins. Traded for 67 Pianta Tokens at the Pianta Parlor (with the Platinum Card). Dropped by Amazy Dayzees and Elite Wizzerds (after battles only). One found in the storage room inside the shop in Twilight Town. One found in a hidden block near the top of the hill on Keelhaul Key. Three found in the Palace of Shadow. Cooked by Zess T. (Point Swap + Ultra Shroom). Given as a shopping prize (250 points). The Honey Jar from Super Paper Mario looks almost identical to the Jammin' Jelly without the bow. This page was last edited on December 10, 2018, at 11:35.